This is the best-selling video in Hawaii Volcanoes National Park. Our Eruption Update video combines a running history of the most recent eruption of Kilauea Volcano (35 years worth!) with narration told from a personal point of view. We want you to really feel what it's like to work on an active volcano, and understand more about the incredible range of eruptive behavior on Kilauea. Follow us as we work, and scientists from the Hawaiian Volcano Observatory as they monitor the eruption. Here you get the real sights and sounds of the volcano... all that's missing is the heat and the smell (sulfur, gotta love it). From the roaring high fountains of the late 1980s to the destruction of Kalapana by lava in 1990, from the magnificent spatter cones of the 1990s to the spectacular fissure eruption of 2011, Kilauea Volcano is always erupting, always dynamic, and constantly changing the landscape. 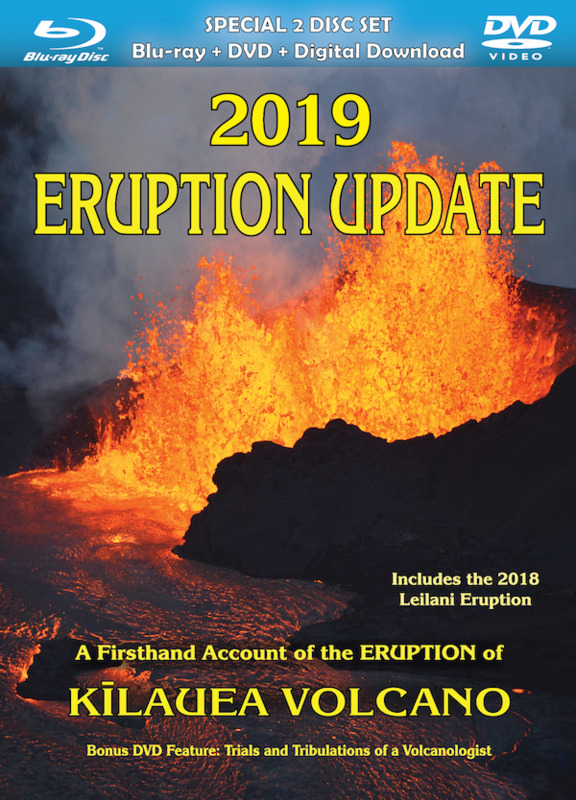 A special 20 minute piece on the devastating 2018 eruption has been added in this edition. There is nothing comparable to experiencing an eruption up close - and we've never seen another video or TV show that can really give you that feeling. Narrated by volcanologist Ken Hon and photographer John Kjargaard.